Early pioneers to the Fargo area ran into hardships living on the edge of the Great Plains. They took comfort in the fact that most of their neighbors would come to their aid if need be. They also took comfort in a friendly game of cards, some fiddle, and shot or two of the local drink to calm their souls. It was never easy for anyone, but to make thing just a little bit better they sang songs and wrote about their experiences in the new land. From North Dakota to Texas, poetry and song ran up and down the Great Plains; some healing, some helping people cope, while others helped people realize they needed to get out . . .get back to civilization . . . back to cities like Fargo. Some of these folks lived in sod homes and shanties out on the plains for different reasons. Some couldn’t afford the milled lumber, while others didn’t have to tools or the know-how to construct a log cabin. There were some who simply wanted to save money and used the soddie as a temporary home. Others deemed the soddie as a proper home, but that is for another day. 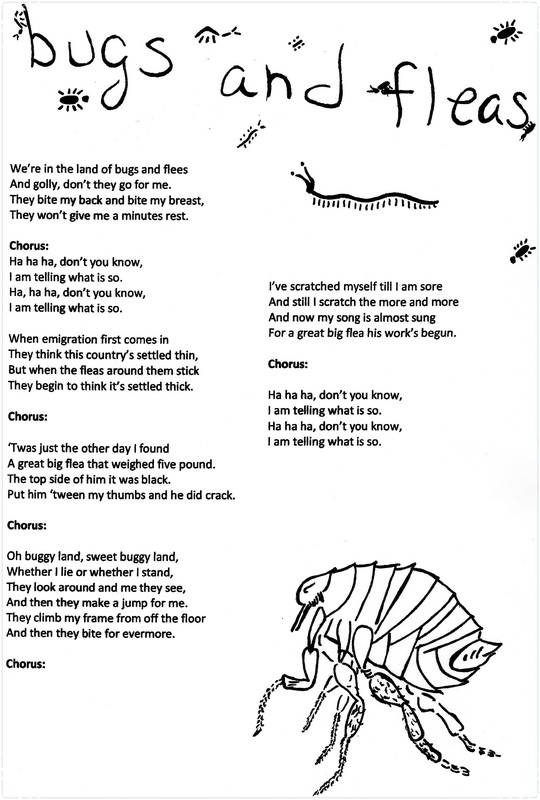 The first song is called “Bugs and Fleas” and is focused mostly on the sod home, but could easily be sung for anyone living a tar paper shack or a dig out as well. It is sung by the tune of “The Little Brown Jug.” Give it a try. 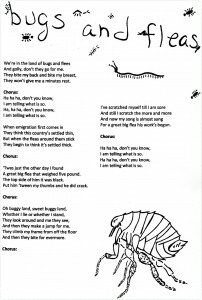 Many of these songs could be used to support the efforts of those who were trying to stick it out on the plains while others used them as an excuse to get out! This next poem was used for both. 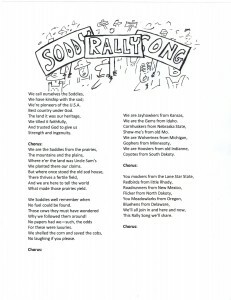 Soddy Rally Song, Drawing copied by Robert Kurtz: Roger L. Welsch, Sod Walls: The Story of the Nebraska Sod House, (Broken Bow: Purcells, Inc., 1968), 174-176. 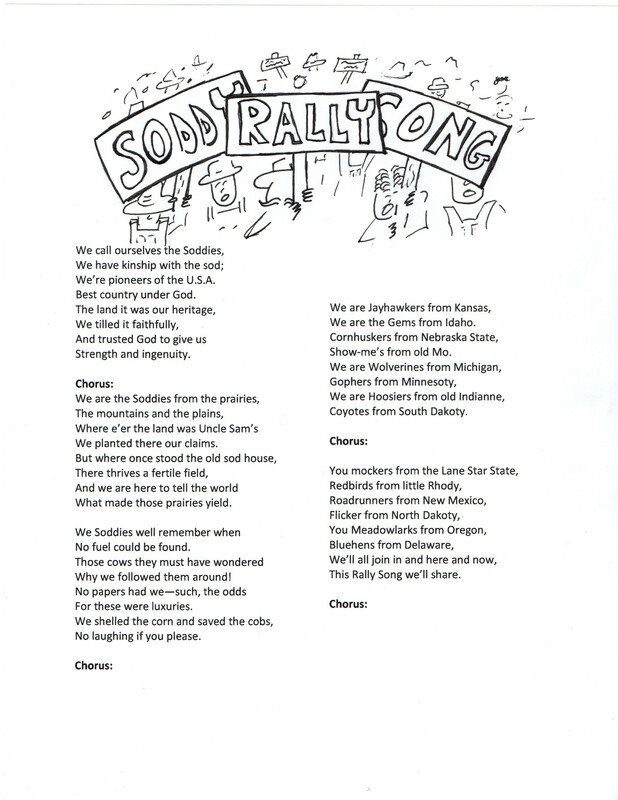 Of course, all of the lyrics to these songs could, and were, changed around to accommodate the region and the people. How the songs were sung could also vary greatly. It could be assumed that many pioneers would make up their own versions of a song or a poem the same way many of us do today when we need to pass the time.